Burmese specialty beans hit the international market. And Winrock is there to celebrate. Many of the 6,000 Burmese farmers whose beans just hit the world market are women smallholders. On August 23, the first shipment of Burmese specialty coffee beans in the United States was ground, brewed and poured at La Colombe Coffee Roasters in Washington, D.C. It was the last step in an improbable voyage that connected 6,000 Burmese coffee growers to a lucrative international market. 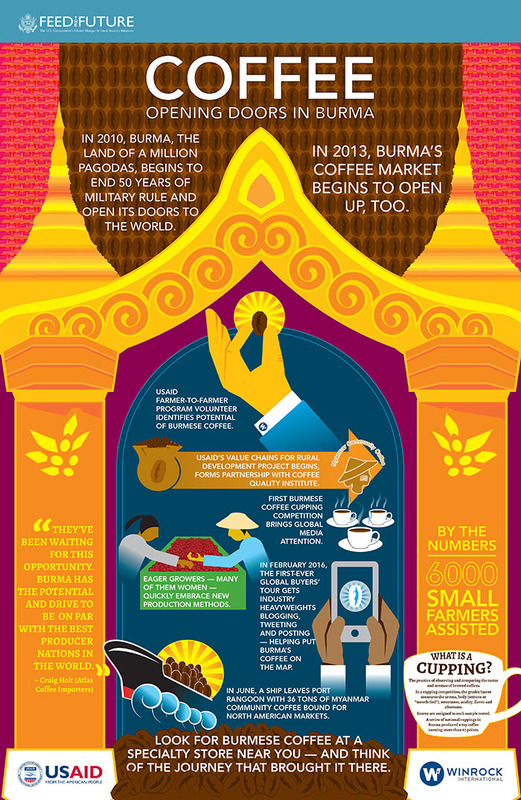 The remarkable story of Burmese coffee began with Rick Peyser, a volunteer with the Farmer-to-Farmer program who identified the potential of Burmese coffee in 2013 and wrote an influential trade article about it. This led to visits from other volunteers and, in 2014, to the creation of the USAID-funded Value Chains for Rural Development project implemented by Winrock. The project introduced new production techniques to eager growers — many of them women smallholders — who took quickly to such new processing methods as drying coffee beans on raised tables rather than on the ground. A collaboration with the Coffee Quality Institute and local partners led to nationwide coffee cupping events that identified the country’s best specialty coffees and introduced a tea-drinking populace to a good cup of java. 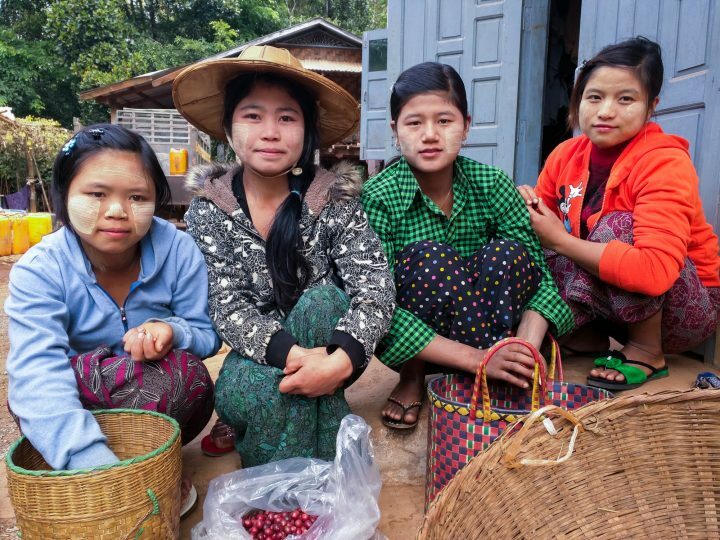 Earlier this year, the project and CQI teamed up with coffee businesses to bring global buyers directly into Burma’s remote coffee-growing areas. By mid-June, 36 tons of prime Arabica beans were steaming their way from Rangoon to North America. In addition to La Colombe, Burmese coffee will also be sold at Whole Foods Market. 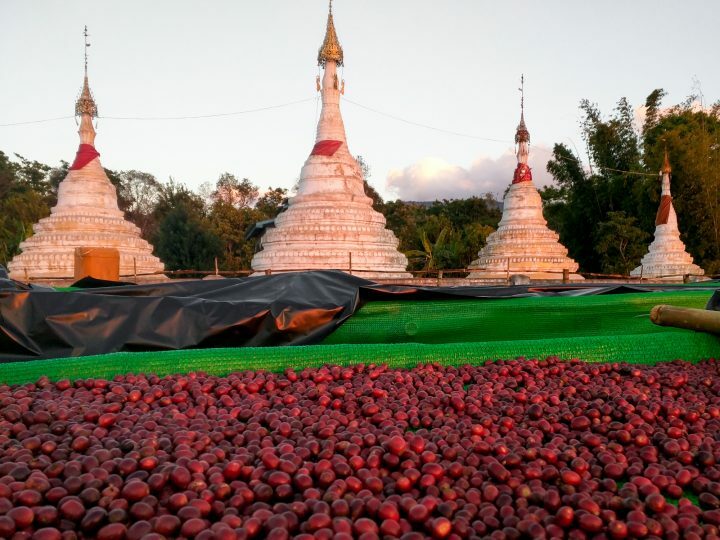 Coffee cherries drying on raised beds in Burma, the Land of a Million Pagodas. Sai Wan Maing of Green Land Coffee Plantation, vice chairman of the Myanmar Coffee Association, is one of those growers. He also buys and processes coffee cherries from smallholder farmers. “I’m very honored to see Myanmar coffee in the United States market,” said Sai Wan, whose coffee won the most recent cupping competition in Burma. You can read more about Burmese coffee in Fortune, Roast Magazine and on Devex.com.